2 SIN EMBARGO, los dos no son intercambiables típicamente. 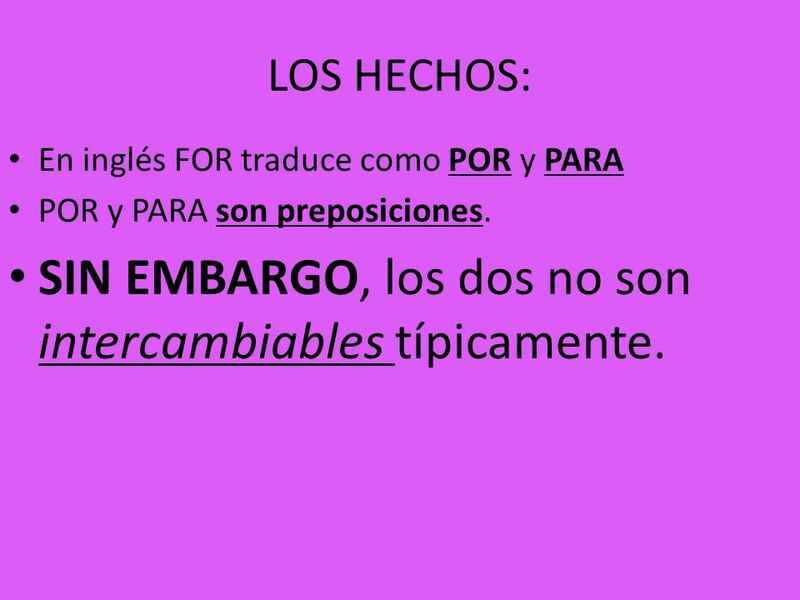 LOS HECHOS: En inglés FOR traduce como POR y PARA POR y PARA son preposiciones. 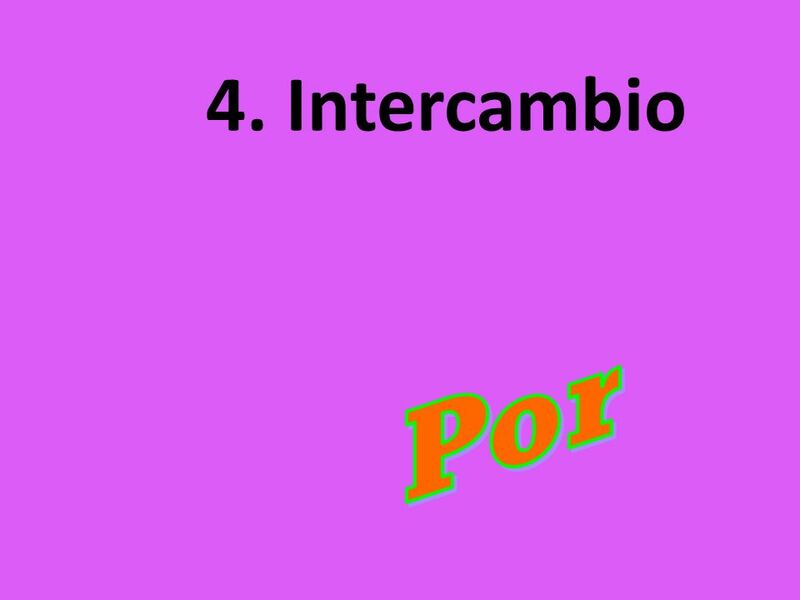 SIN EMBARGO, los dos no son intercambiables típicamente. We dance for fun. 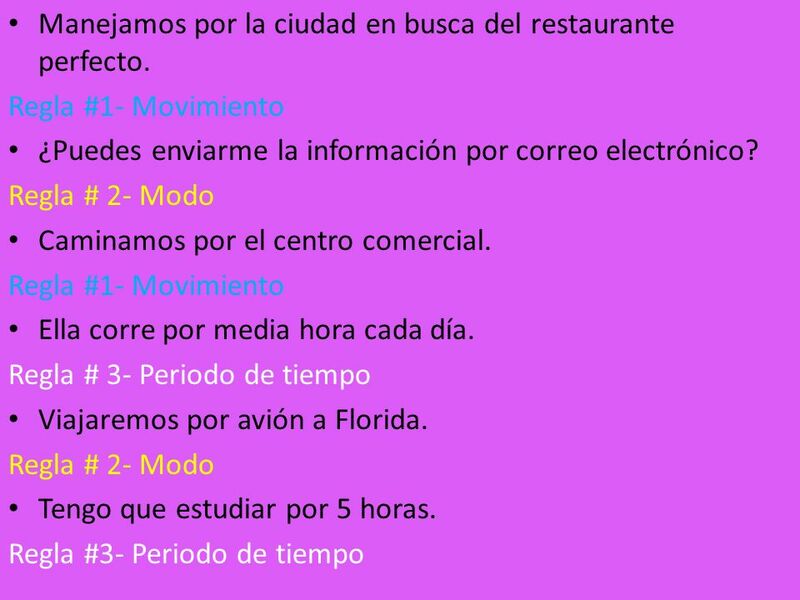 Estudio para aprender I study in order to learn. Esa taza es para café. This cup is for coffee. Trabaja para ganar dinero She works in order to earn money. 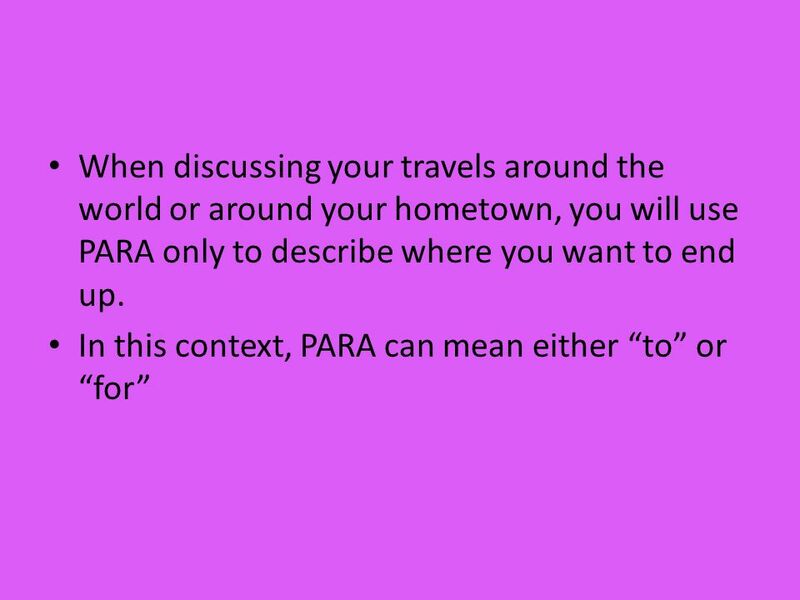 7 PARA tells us not only where, but also TO WHOM something is going. 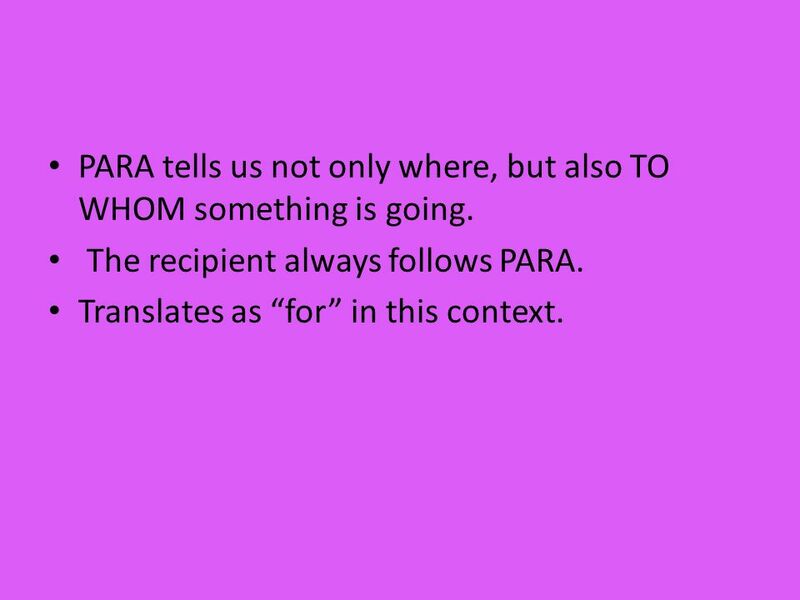 The recipient always follows PARA. 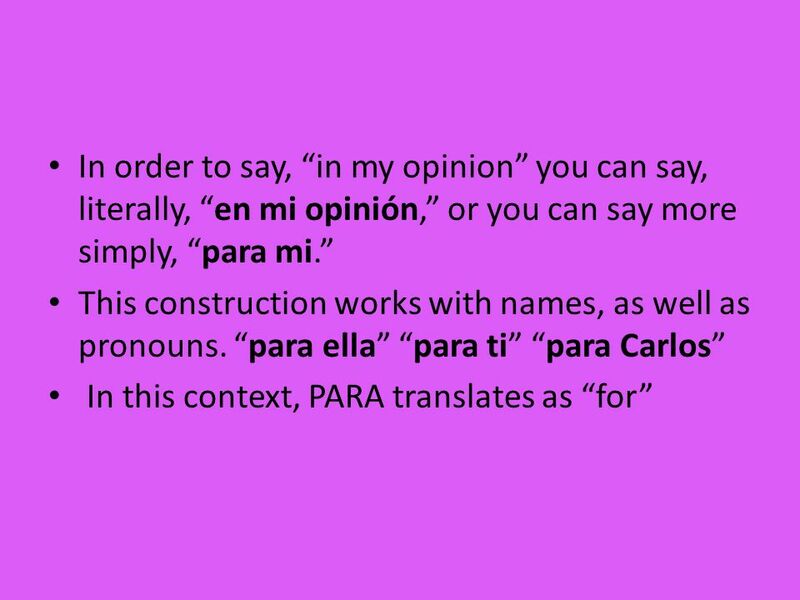 Translates as “for” in this context. 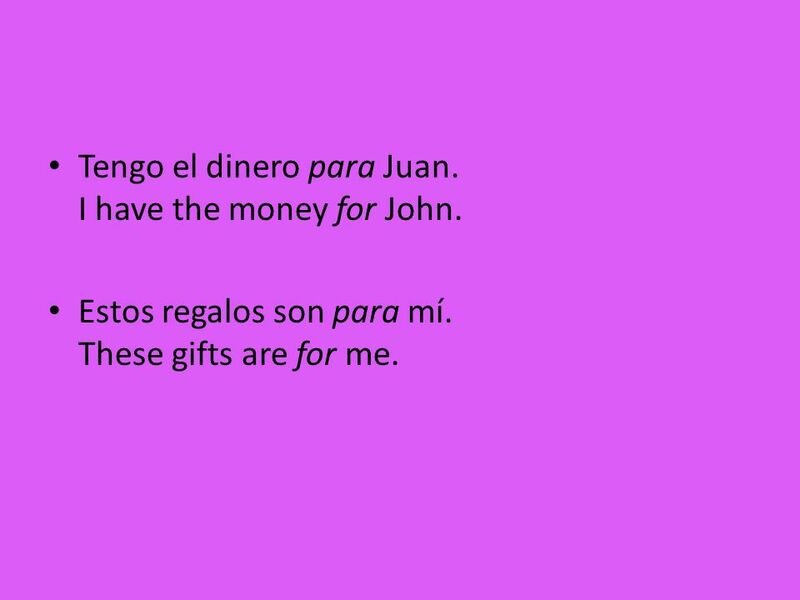 8 Tengo el dinero para Juan. I have the money for John. Estos regalos son para mí. These gifts are for me. 11 Se han ido para la reunion ya. They have left/gone to the meeting already. Saldremos para la iglesia a las nueve. 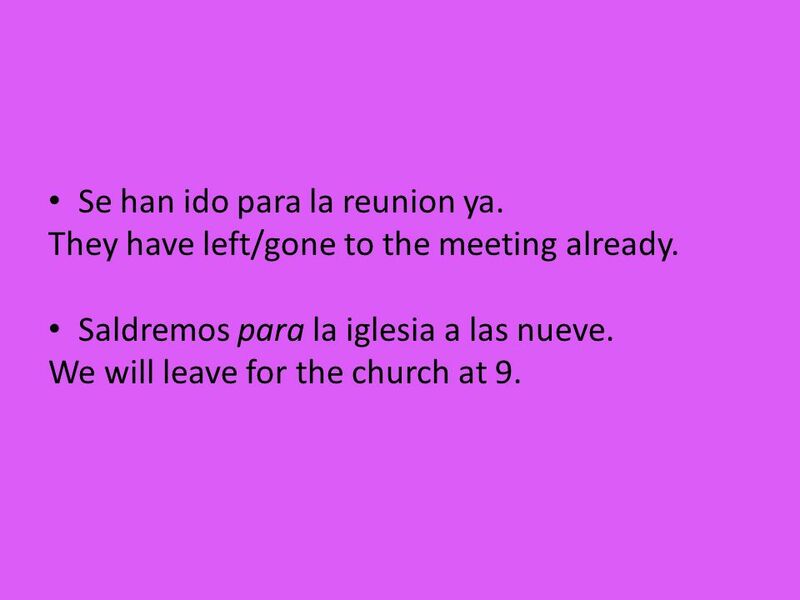 We will leave for the church at 9. 12 El coche nuevo fue para Mercedes. (#2-La persona que recibe la acción) Saldremos para Madrid dentro de 2 semanas. 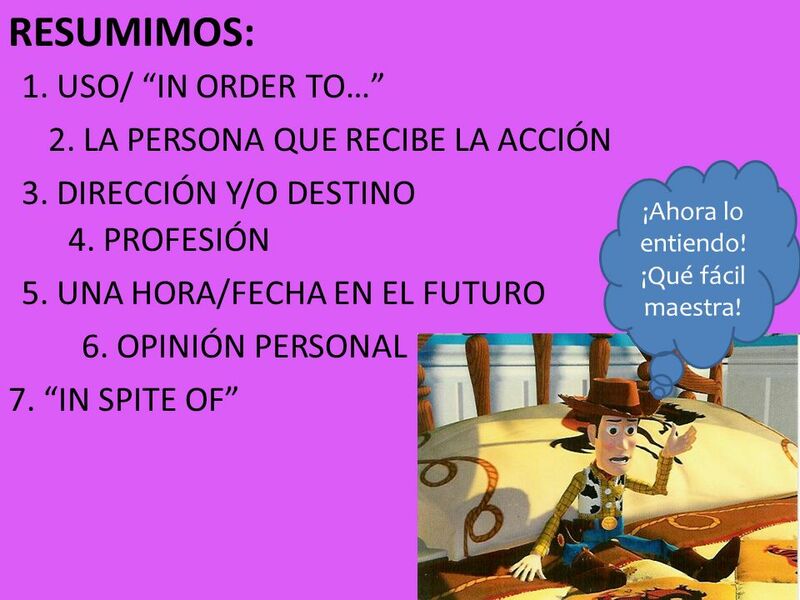 (#3-Direccion y/o Destino) La mesa es para el comedor. 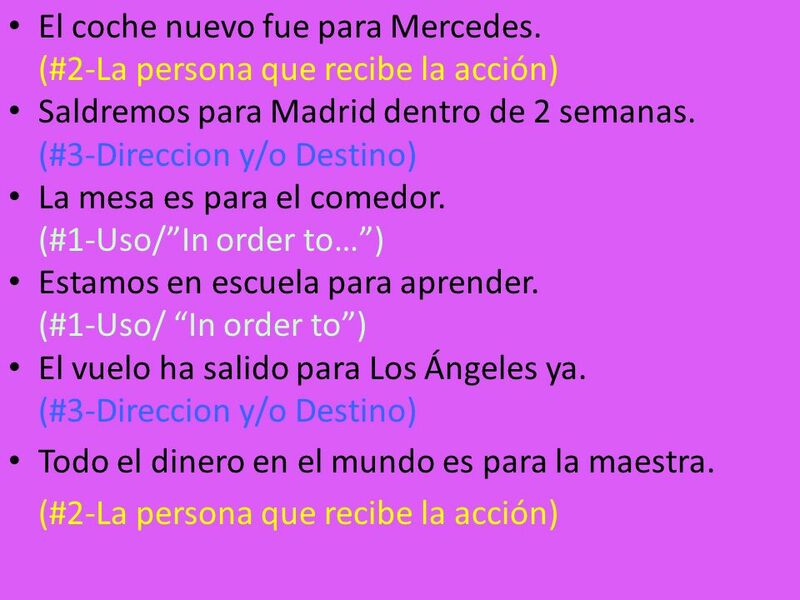 (#1-Uso/”In order to…”) Estamos en escuela para aprender. 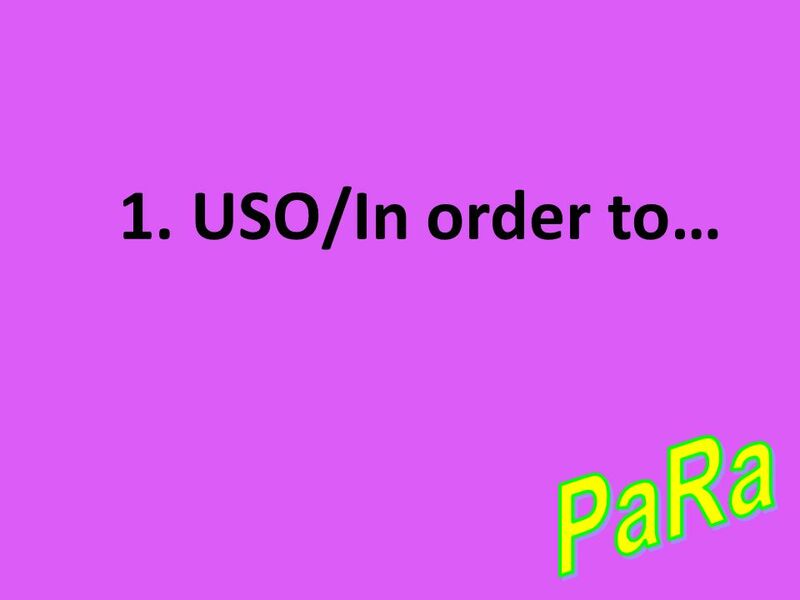 (#1-Uso/ “In order to”) El vuelo ha salido para Los Ángeles ya. 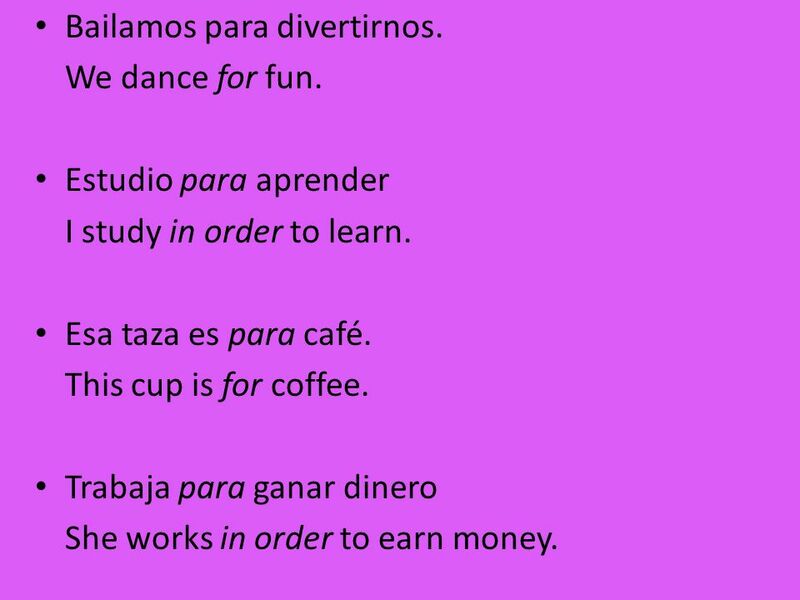 Todo el dinero en el mundo es para la maestra. 15 Trabajamos para M&T We work for M&T. 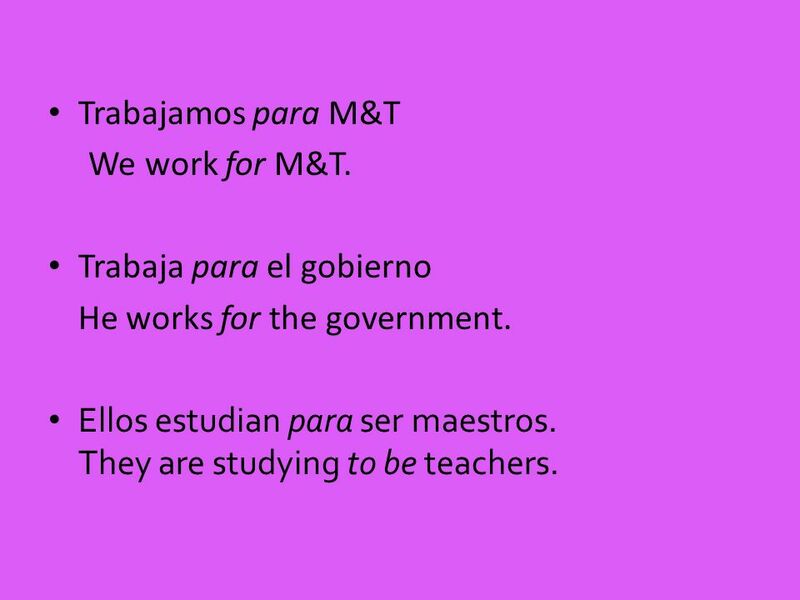 Trabaja para el gobierno He works for the government. Ellos estudian para ser maestros. They are studying to be teachers. 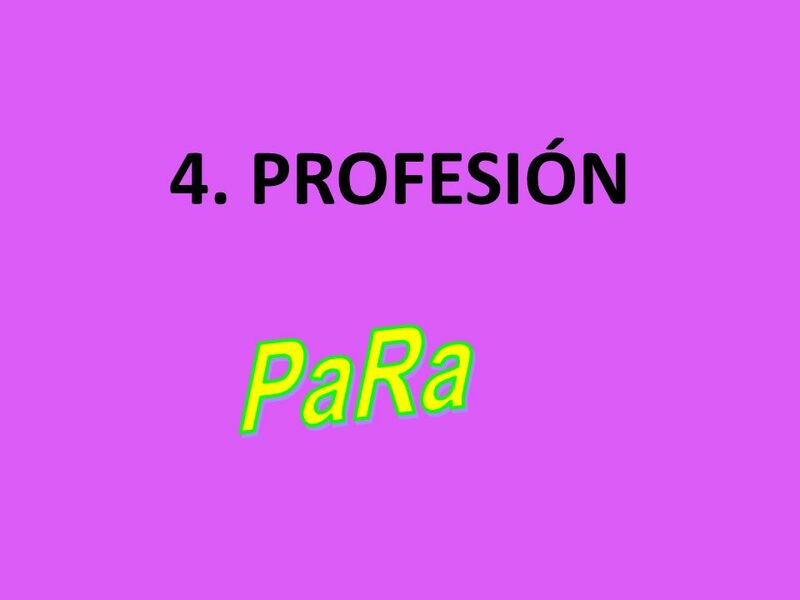 16 I am studying to be a chef (cocinero/a). 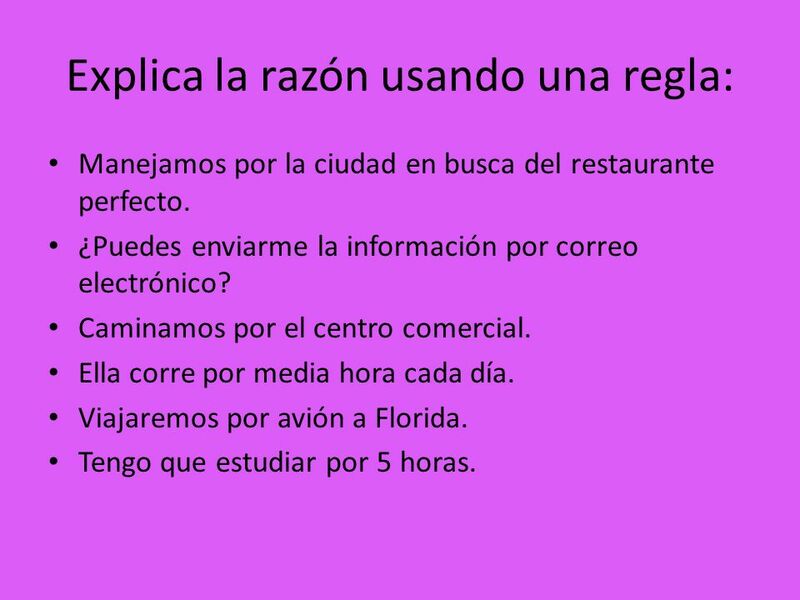 Yo estudio para ser cocinero/a. They (hombres) work for the school. Ellos trabajan para la escuela. I used to work for the airport in Philadelphia. Yo trabajaba para el aeropuerto en Filadelfia. In my opinion (for me), the book is excellent. 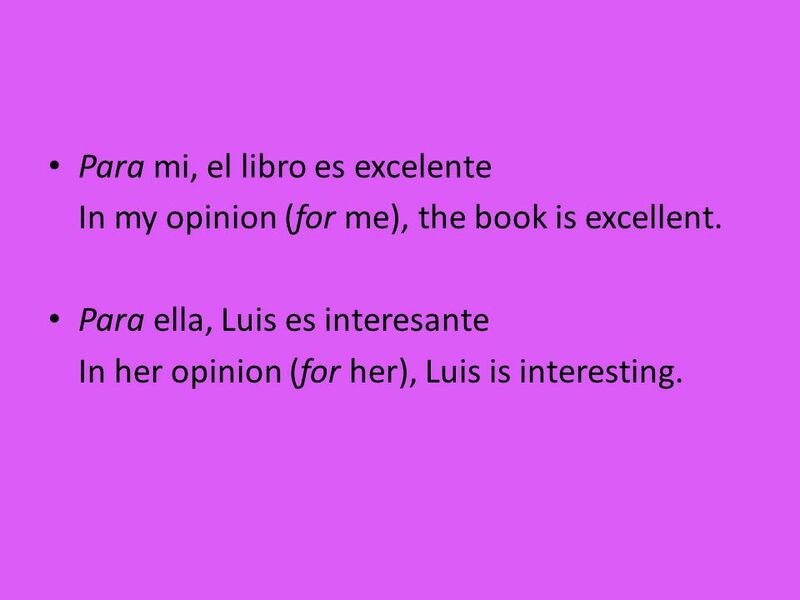 Para ella, Luis es interesante In her opinion (for her), Luis is interesting. 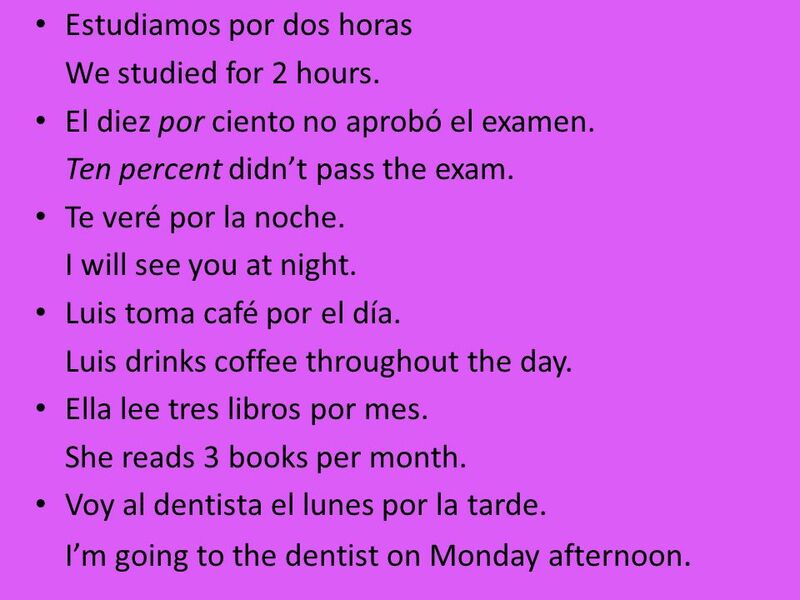 23 For the students, Spanish is better than English. 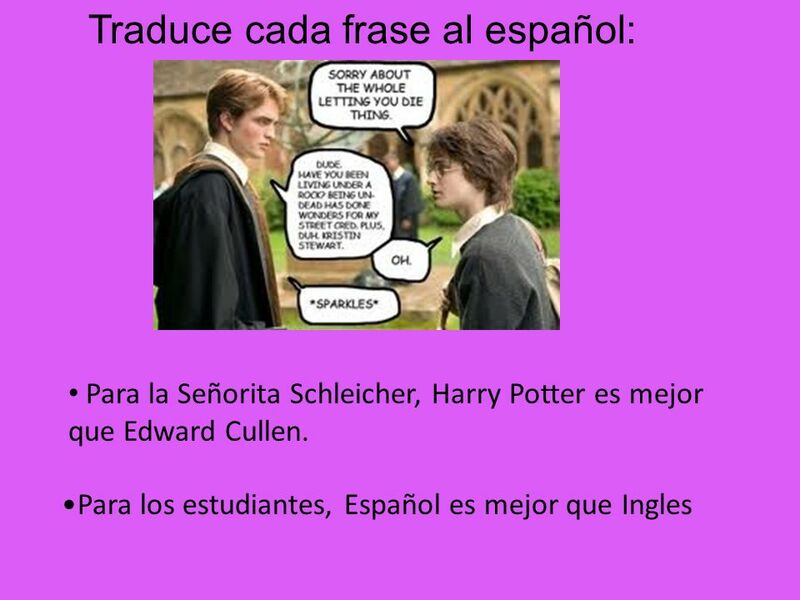 Traduce cada frase al español: For Miss Schleicher(In Miss Schleicher’s opinion), Harry Potter is better than (mejor que) Edward Cullen. For the students, Spanish is better than English. 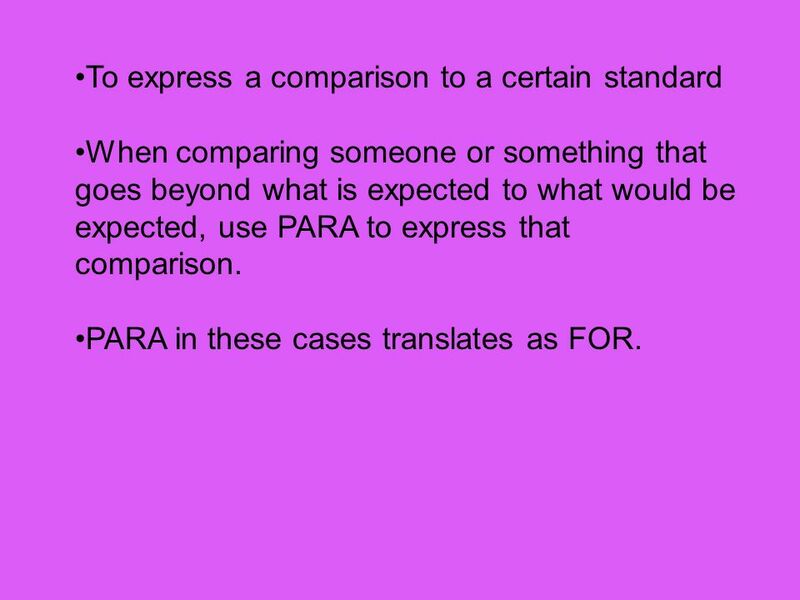 When comparing someone or something that goes beyond what is expected to what would be expected, use PARA to express that comparison. 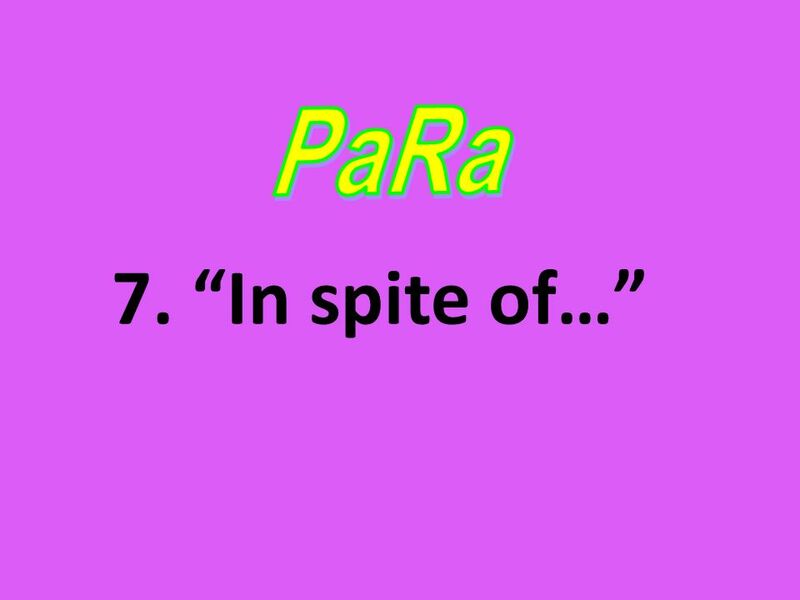 PARA in these cases translates as FOR. 27 Para un viejo, es muy fuerte. For an old guy, he’s very strong. Para un niño tan joven, Marco sabe mucho. 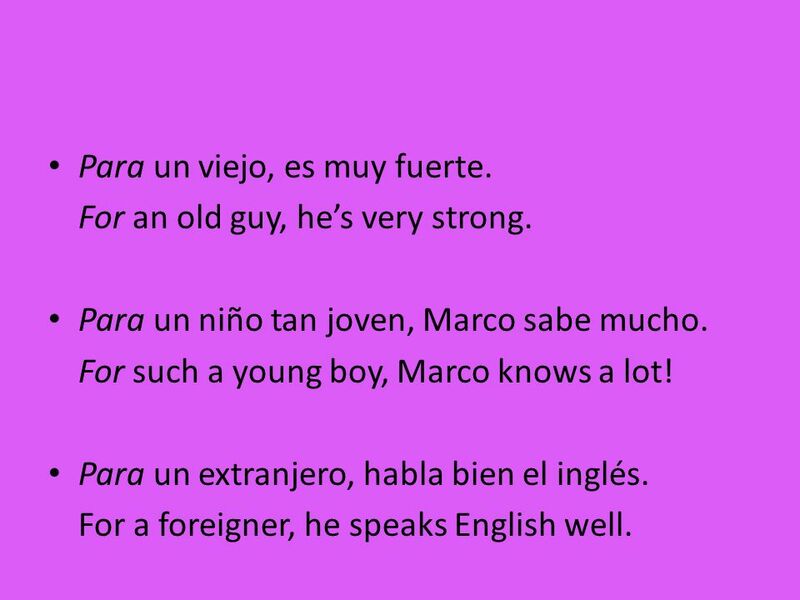 For such a young boy, Marco knows a lot! 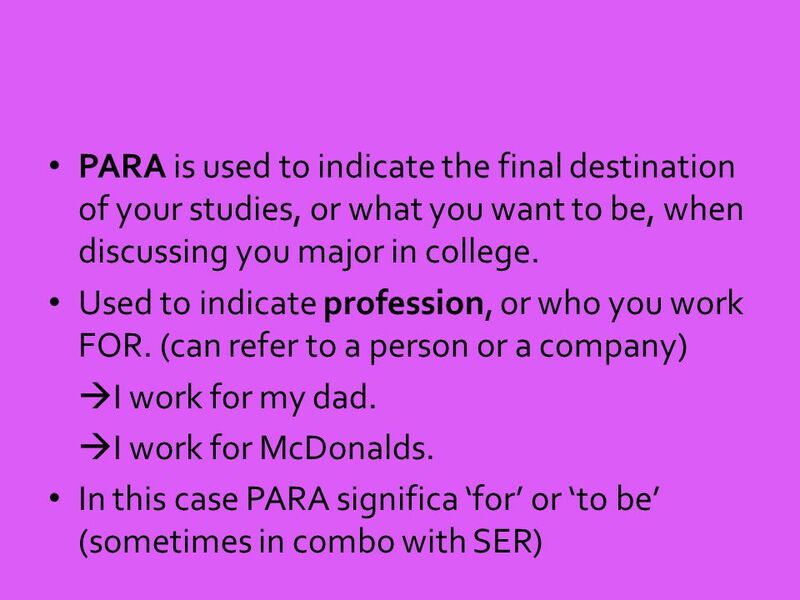 Para un extranjero, habla bien el inglés. For a foreigner, he speaks English well. 28 ¡Ahora lo entiendo! 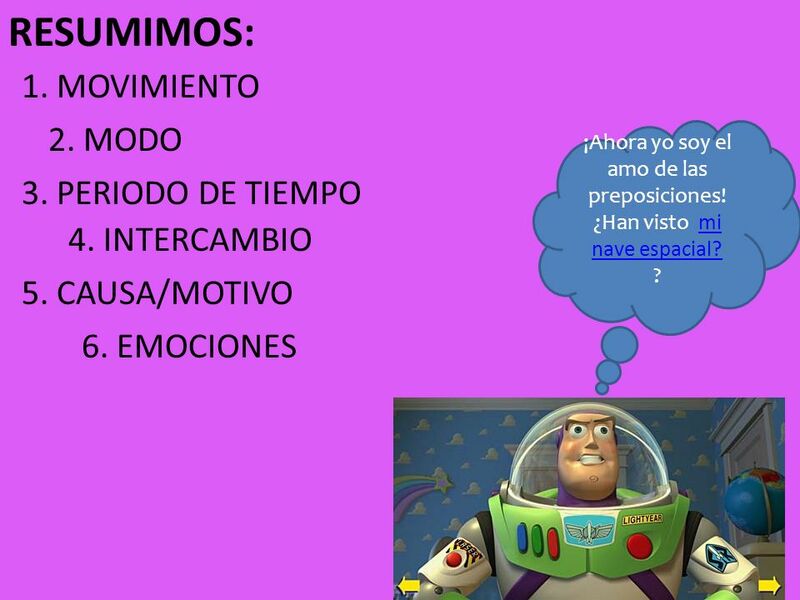 ¡Qué fácil maestra! 30 ¡OJO! 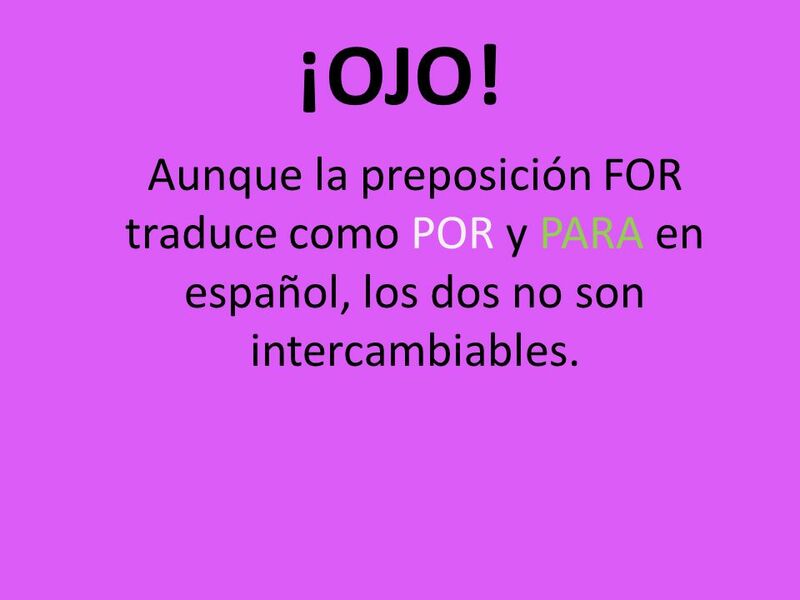 Aunque la preposición FOR traduce como POR y PARA en español, los dos no son intercambiables. 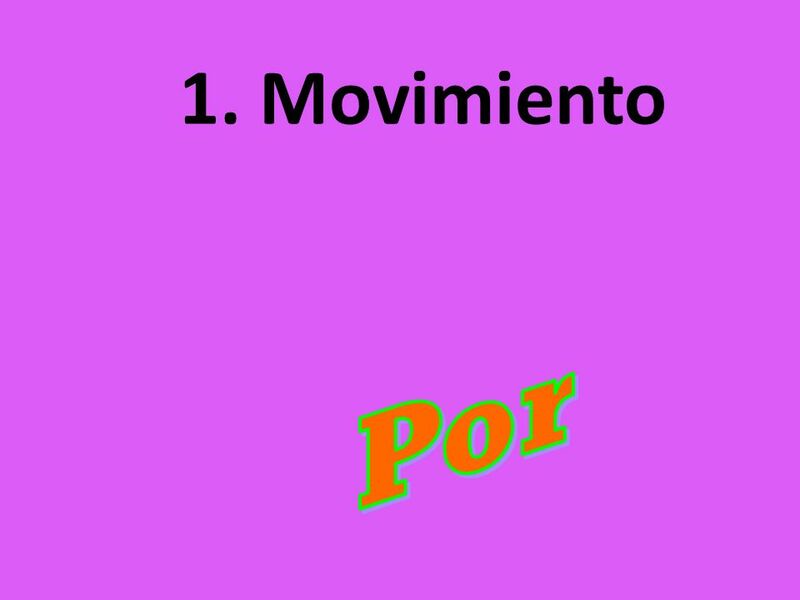 Indicates movement in an area. 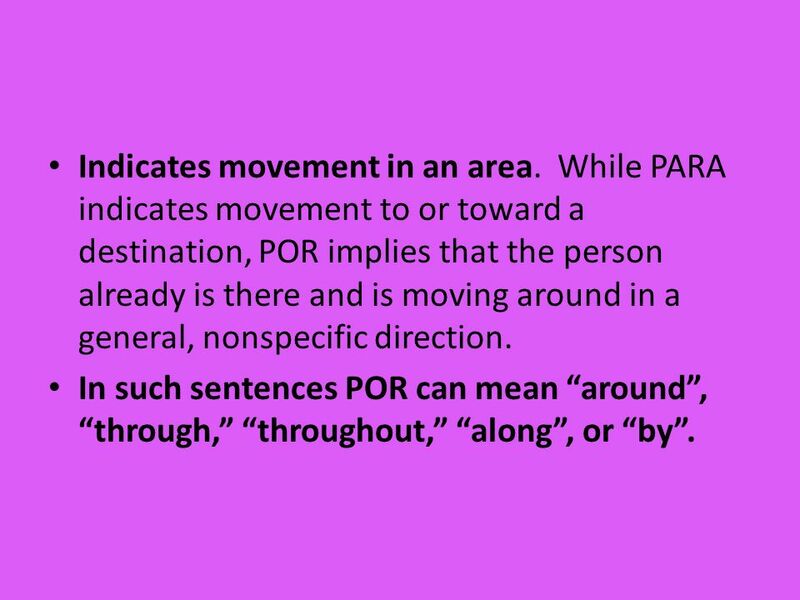 While PARA indicates movement to or toward a destination, POR implies that the person already is there and is moving around in a general, nonspecific direction. 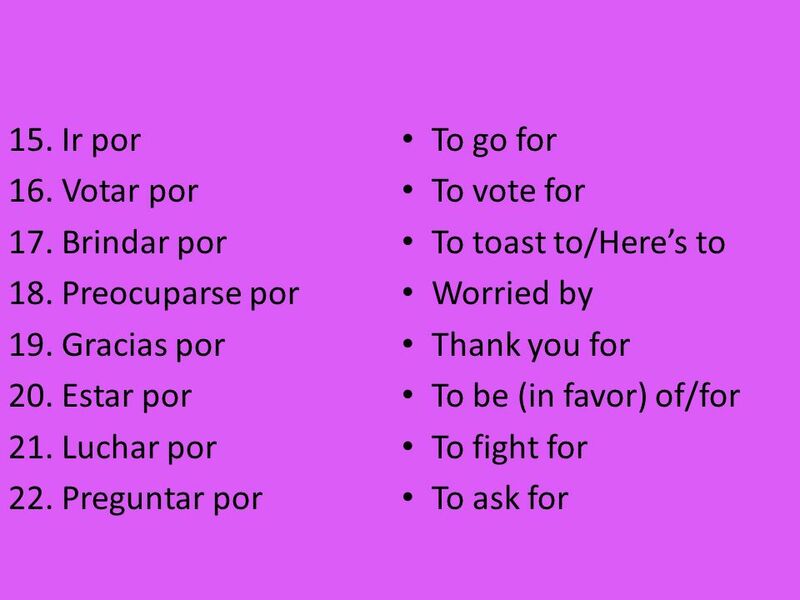 In such sentences POR can mean “around”, “through,” “throughout,” “along”, or “by”. We walk through the park. Damos un paseo por la Avenida. We went on a walk along the Avenue. 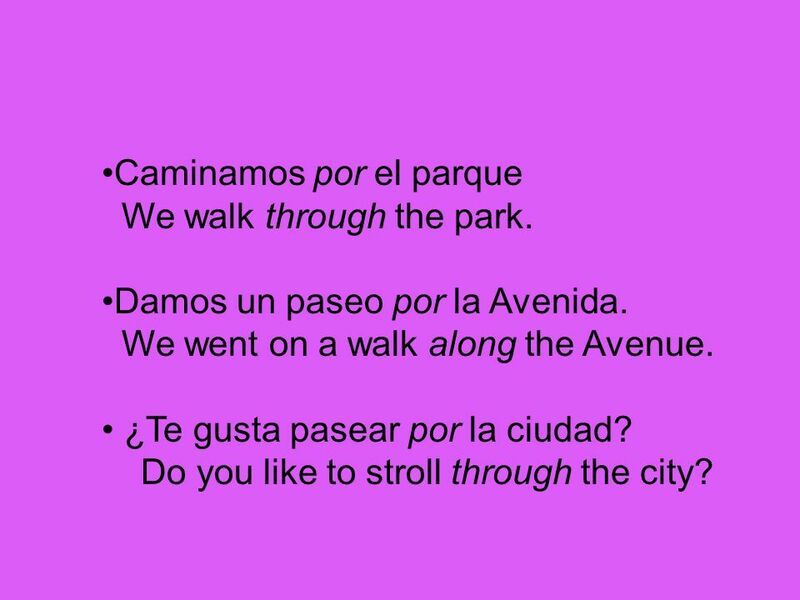 ¿Te gusta pasear por la ciudad? Do you like to stroll through the city? Expresses means of transportation. 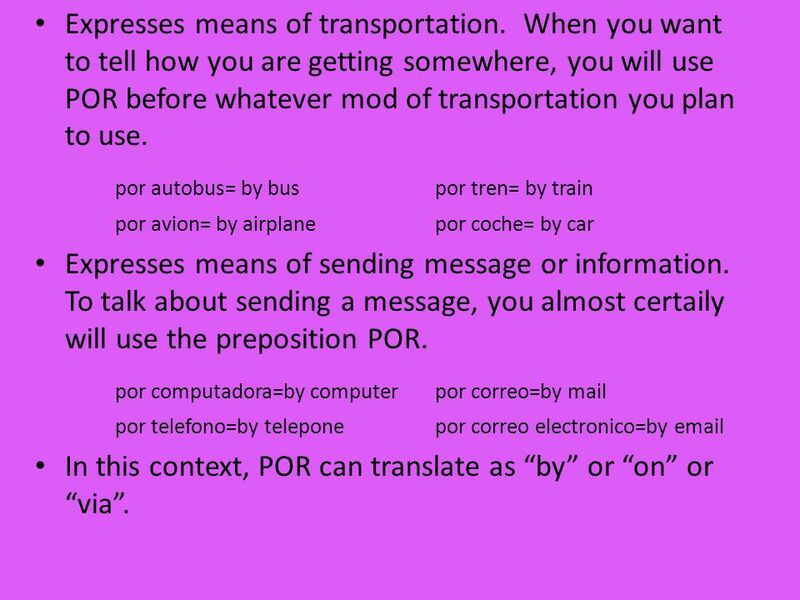 When you want to tell how you are getting somewhere, you will use POR before whatever mod of transportation you plan to use. 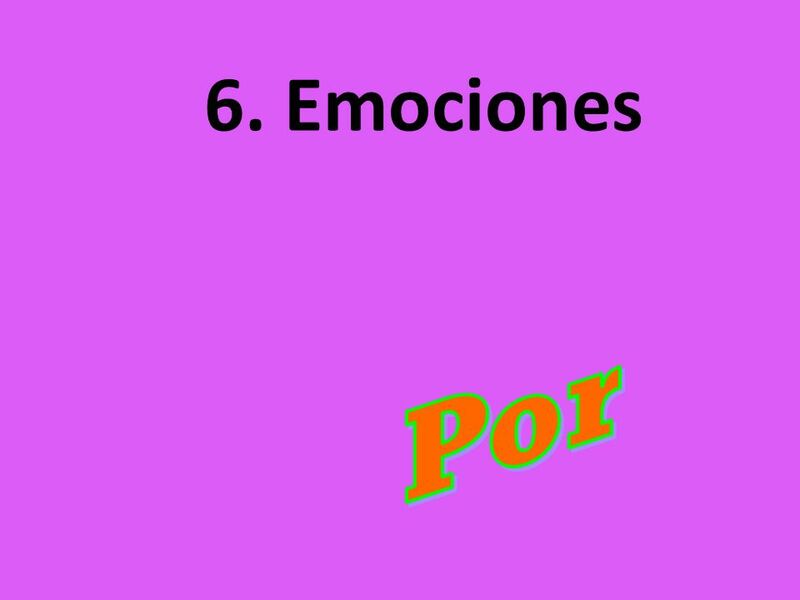 por autobus= by bus	por tren= by train por avion= by airplane por coche= by car Expresses means of sending message or information. 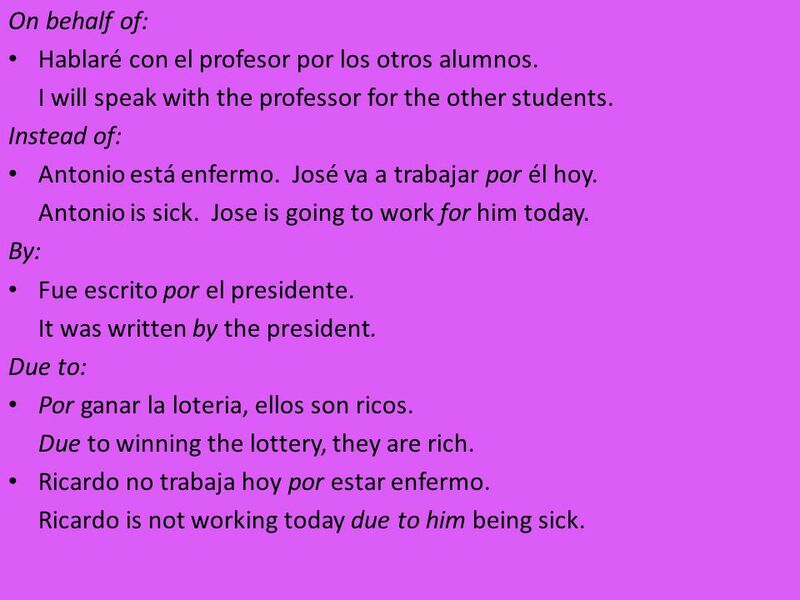 To talk about sending a message, you almost certaily will use the preposition POR. 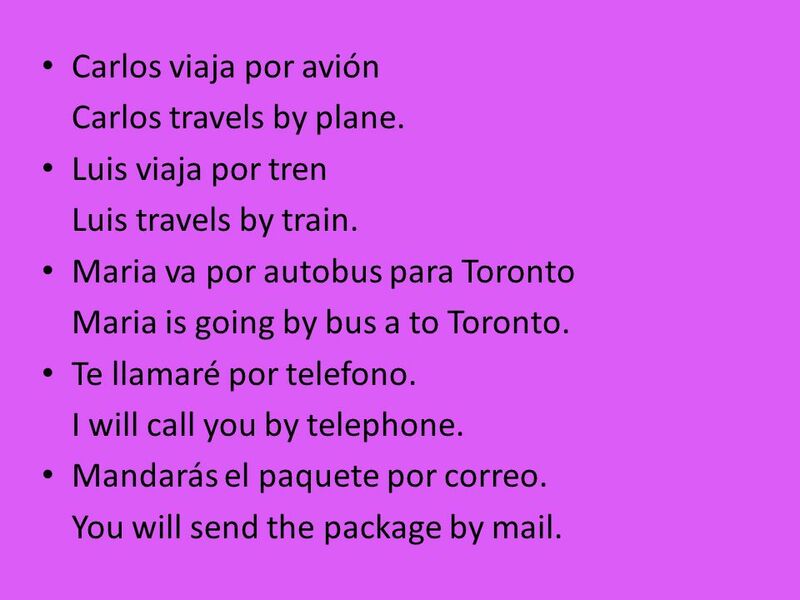 por computadora=by computer	por correo=by mail por telefono=by telepone	por correo electronico=by In this context, POR can translate as “by” or “on” or “via”. 36 Carlos viaja por avión Carlos travels by plane. Luis viaja por tren Luis travels by train. Maria va por autobus para Toronto Maria is going by bus a to Toronto. Te llamaré por telefono. I will call you by telephone. Mandarás el paquete por correo. You will send the package by mail. Expresses a duration of time. 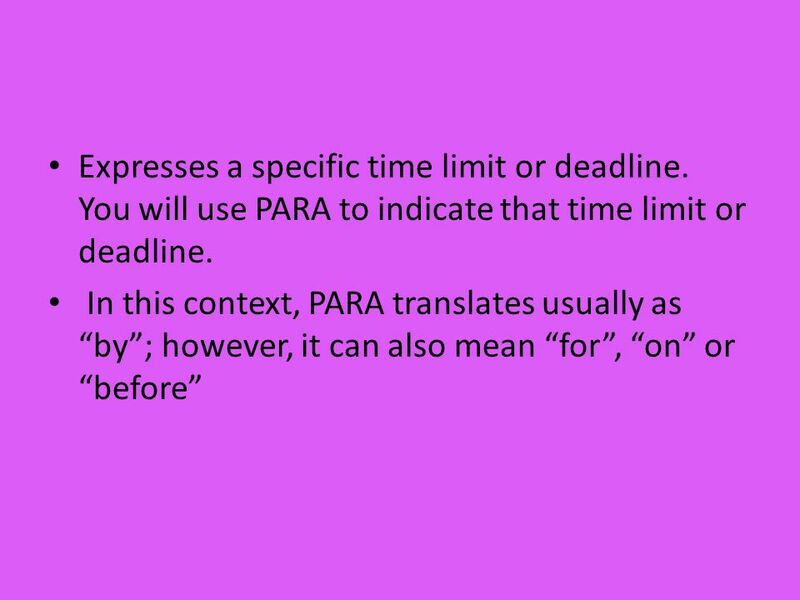 When expressing the duration of something, this is telling how long something lasts—you use POR. 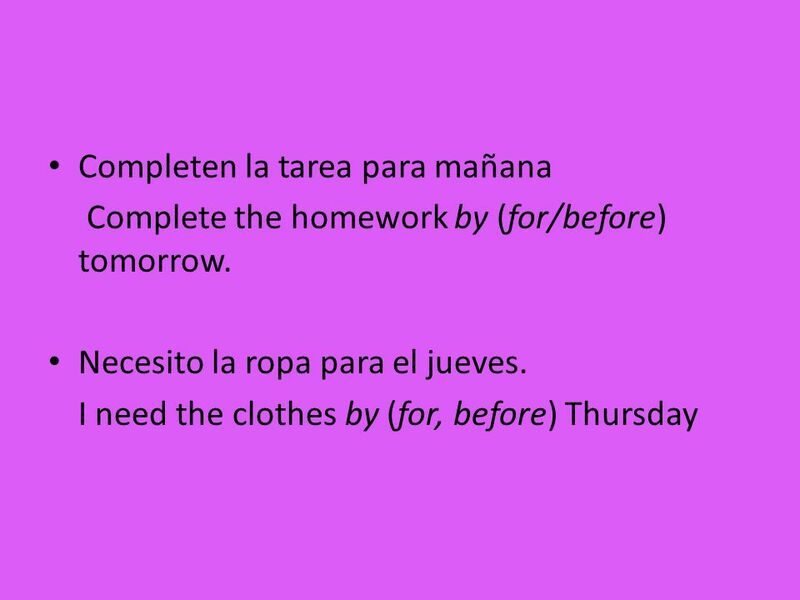 In this context POR translates as “for”, “at”, “during”, “on” or “throughout” Also expresses the Latin term PER. 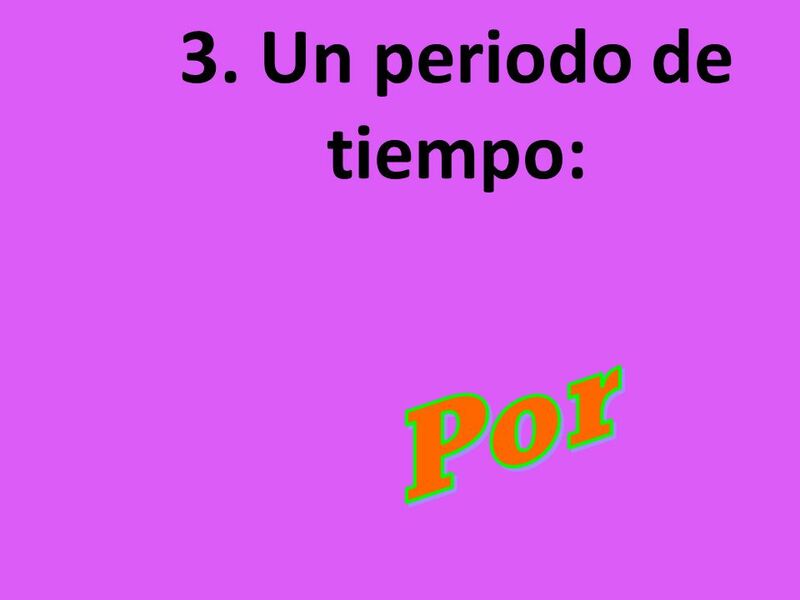 When we speak of times per day, minutes per hour, or the percentage of something, we use POR to express this relationship. 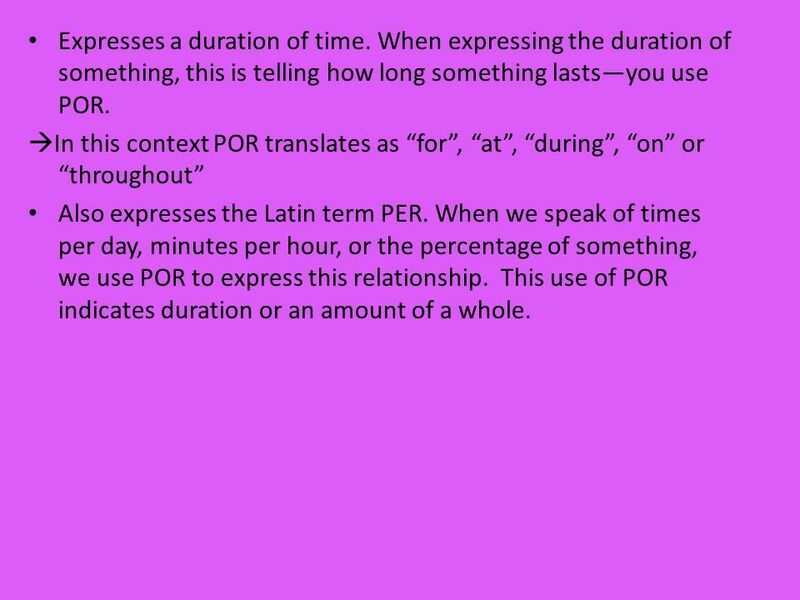 This use of POR indicates duration or an amount of a whole. We studied for 2 hours. El diez por ciento no aprobó el examen. Ten percent didn’t pass the exam. Te veré por la noche. I will see you at night. Luis toma café por el día. Luis drinks coffee throughout the day. Ella lee tres libros por mes. She reads 3 books per month. Voy al dentista el lunes por la tarde. I’m going to the dentist on Monday afternoon. Manejamos por la ciudad en busca del restaurante perfecto. ¿Puedes enviarme la información por correo electrónico? Caminamos por el centro comercial. Ella corre por media hora cada día. Viajaremos por avión a Florida. Tengo que estudiar por 5 horas. 41 Manejamos por la ciudad en busca del restaurante perfecto. 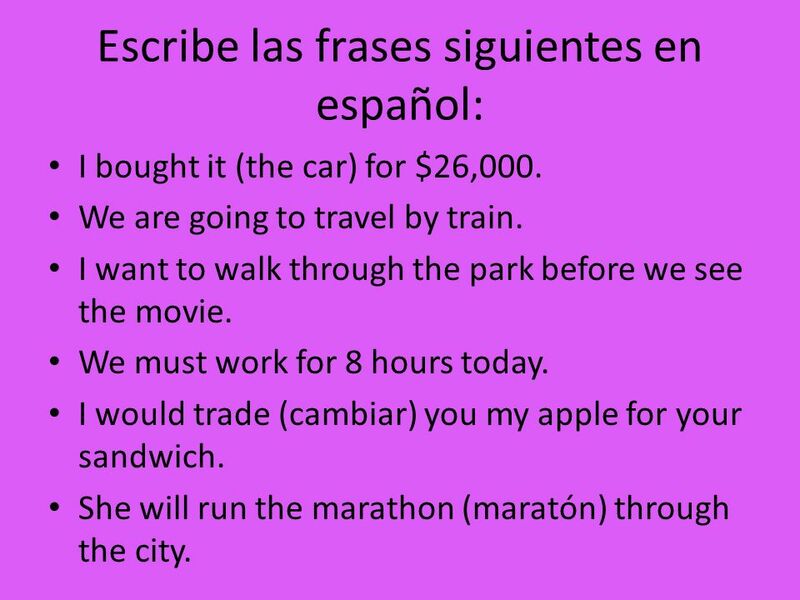 44 Pagamos $10,000 por el coche We pay $10,000 for the car. Pagué cinco dolares por la pizza. I paid five dollars for the pizza. Juan siempre cambiaba su manzana por una naranja. 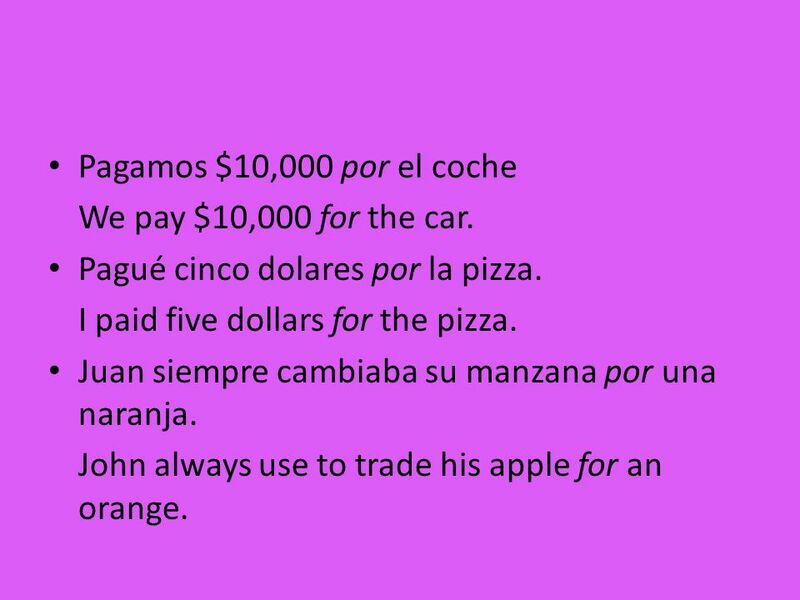 John always use to trade his apple for an orange. I bought it (the car) for $26,000. We are going to travel by train. I want to walk through the park before we see the movie. We must work for 8 hours today. I would trade (cambiar) you my apple for your sandwich. 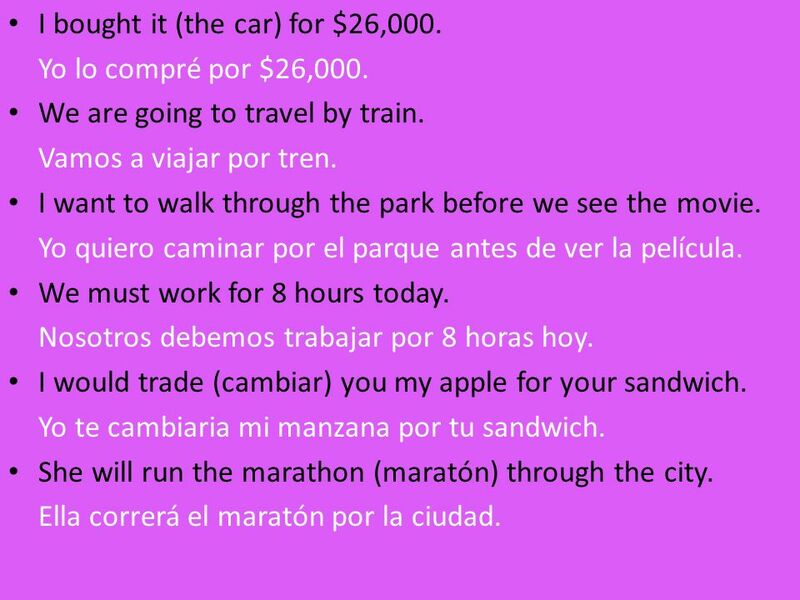 She will run the marathon (maratón) through the city. 46 I bought it (the car) for $26,000. Yo lo compré por $26,000. We are going to travel by train. Vamos a viajar por tren. I want to walk through the park before we see the movie. Yo quiero caminar por el parque antes de ver la película. We must work for 8 hours today. Nosotros debemos trabajar por 8 horas hoy. I would trade (cambiar) you my apple for your sandwich. Yo te cambiaria mi manzana por tu sandwich. She will run the marathon (maratón) through the city. Ella correrá el maratón por la ciudad. 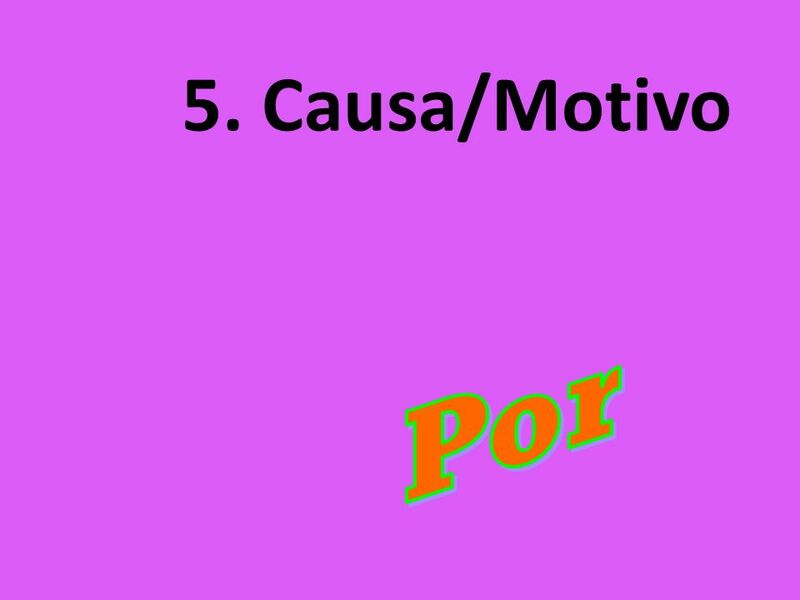 Indicates having done something or “because of” (por+infinitivo). 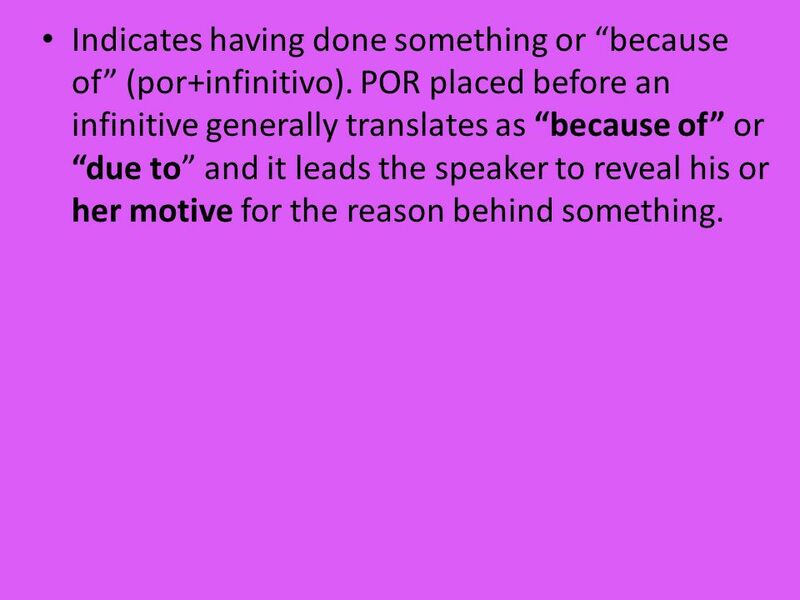 POR placed before an infinitive generally translates as “because of” or “due to” and it leads the speaker to reveal his or her motive for the reason behind something. 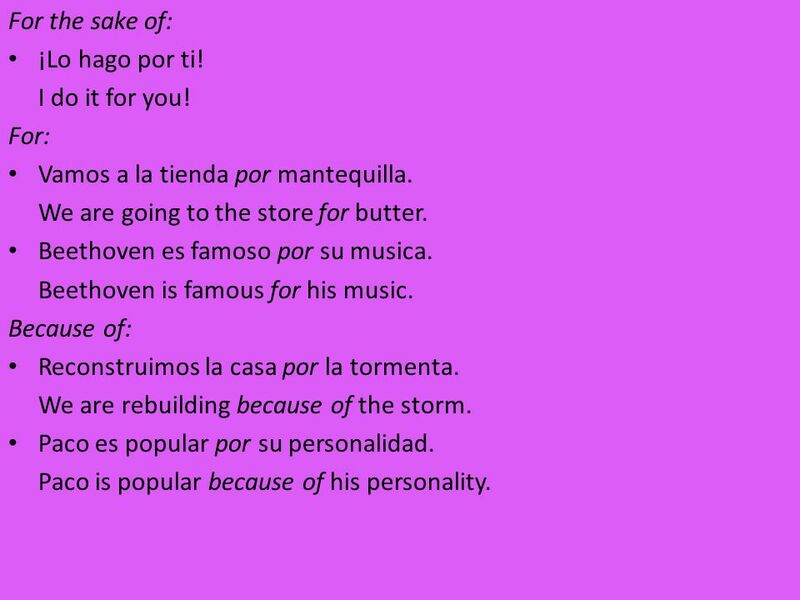 49 For the sake of: ¡Lo hago por ti! I do it for you! For: Vamos a la tienda por mantequilla. We are going to the store for butter. Beethoven es famoso por su musica. Beethoven is famous for his music. Because of: Reconstruimos la casa por la tormenta. We are rebuilding because of the storm. Paco es popular por su personalidad. Paco is popular because of his personality. 50 On behalf of: Hablaré con el profesor por los otros alumnos. I will speak with the professor for the other students. Instead of: Antonio está enfermo. José va a trabajar por él hoy. Antonio is sick. Jose is going to work for him today. By: Fue escrito por el presidente. It was written by the president. Due to: Por ganar la loteria, ellos son ricos. Due to winning the lottery, they are rich. Ricardo no trabaja hoy por estar enfermo. Ricardo is not working today due to him being sick. 52 Expresses a liking (or disliking) or an emotion for someone or something. 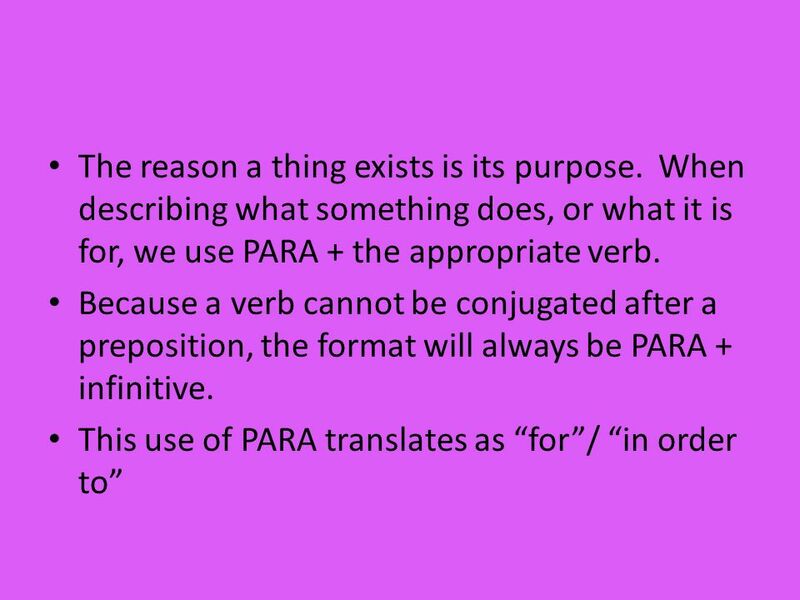 When you have something tangible, such as book, for someone, you will use PARA. 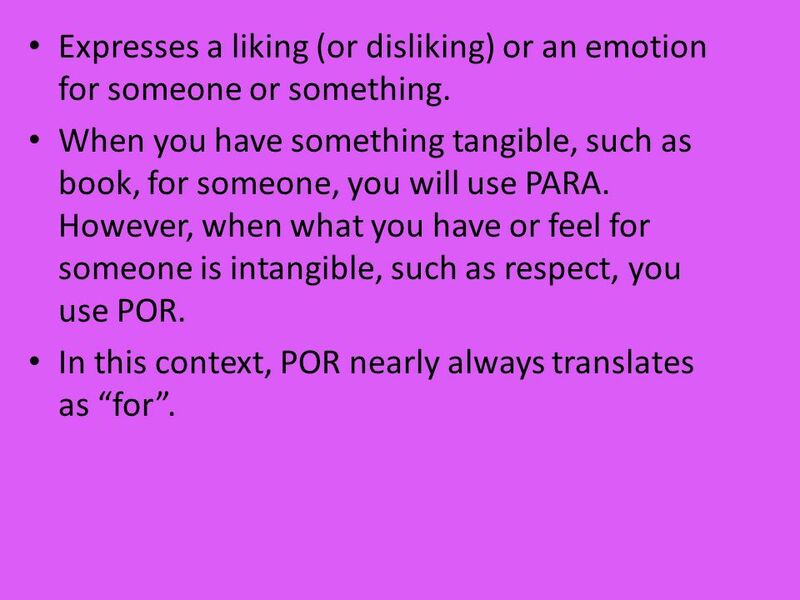 However, when what you have or feel for someone is intangible, such as respect, you use POR. 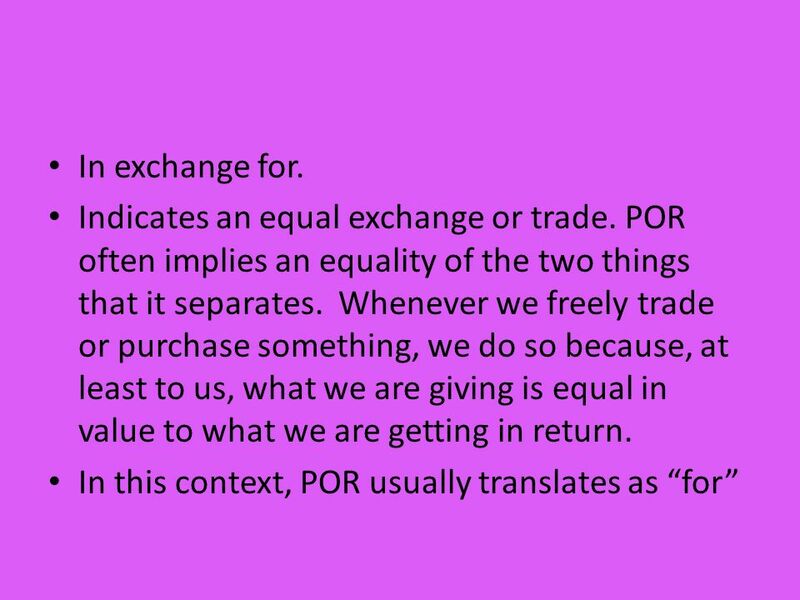 In this context, POR nearly always translates as “for”. 53 Juan tiene mucho amor por su esposa. 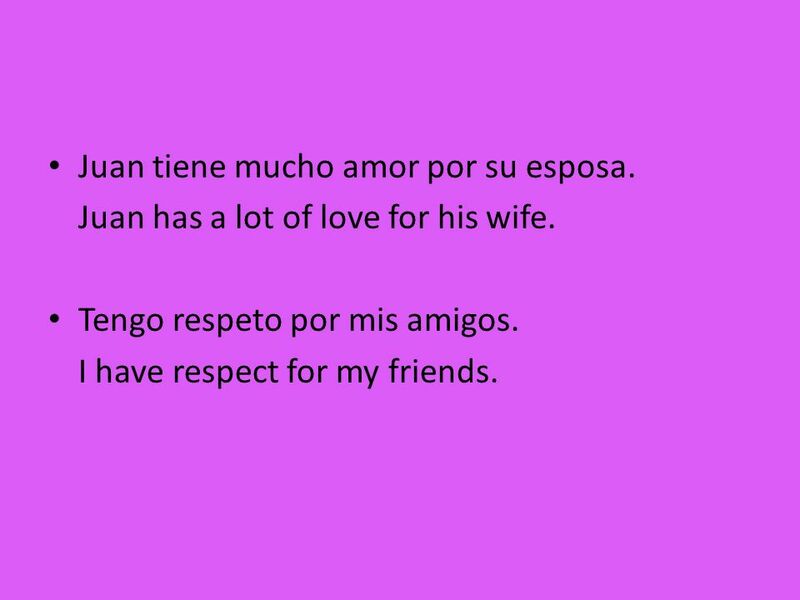 Juan has a lot of love for his wife. Tengo respeto por mis amigos. I have respect for my friends. Pagamos cien dólares por la silla. Vamos a Ámsterdam por avión. La casa fue destruida por el terremoto (earthquake) Nadie trabaja por mi cuando estoy enfermo. 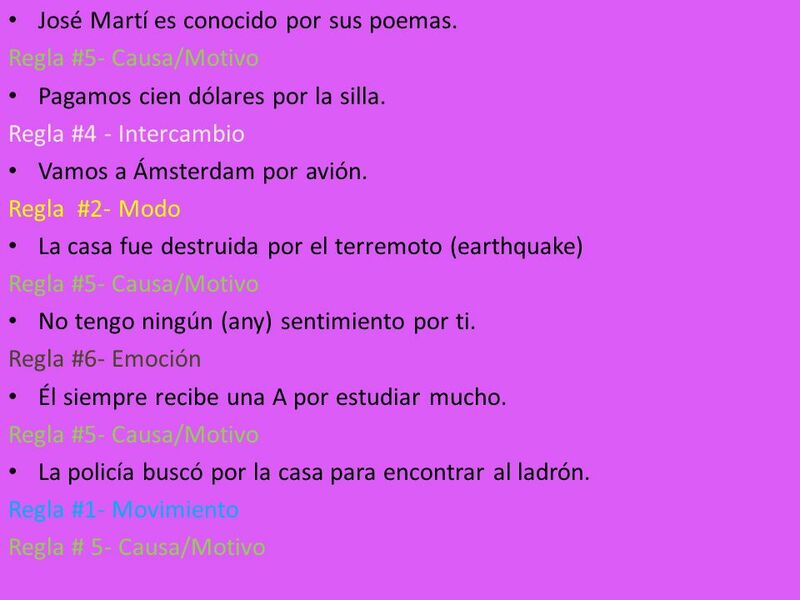 José Martí es conocido por sus poemas. No tengo ningún (any) sentimiento por ti. Él siempre recibe una A por estudiar mucho. La policía buscó por la casa para encontrar al ladrón. 55 José Martí es conocido por sus poemas. 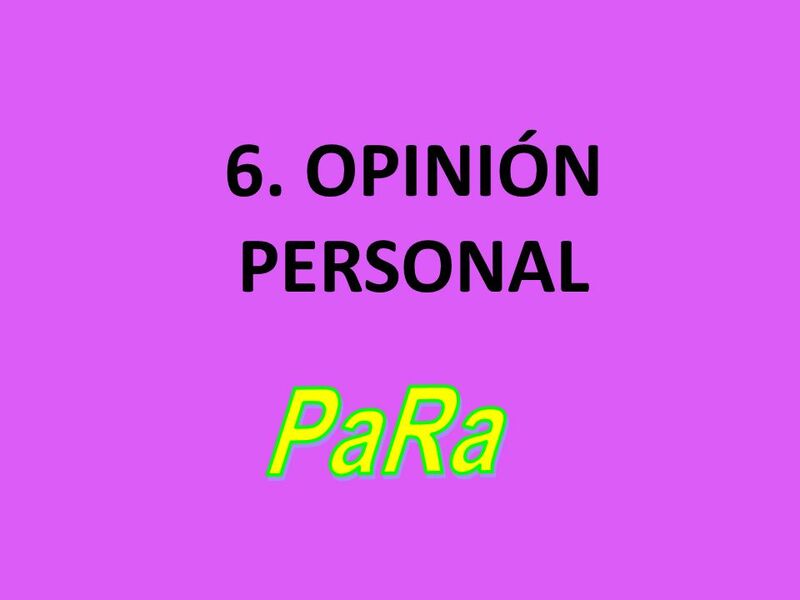 Descargar ppt "PaRa vs. Por." Los usos de por y para. 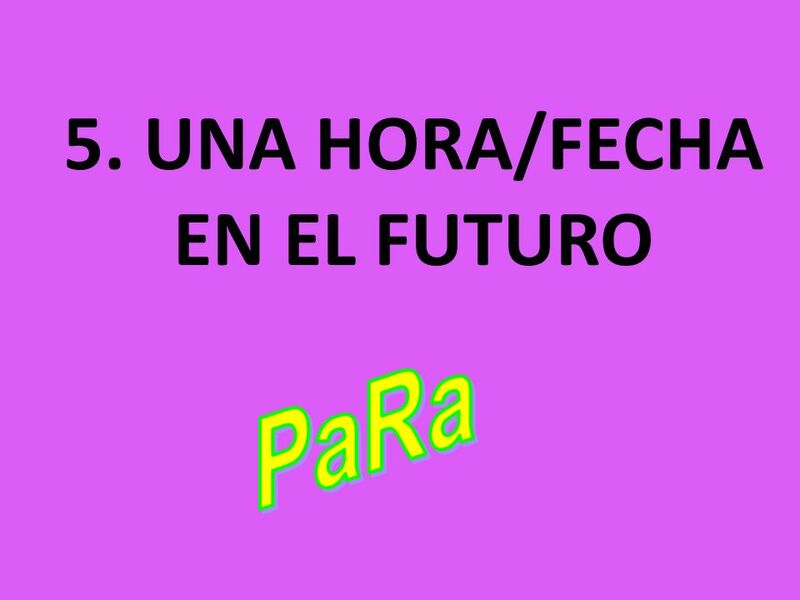 for, during or in a period of time Voy a dormir por una semana. Se reunen manana por la tarde. 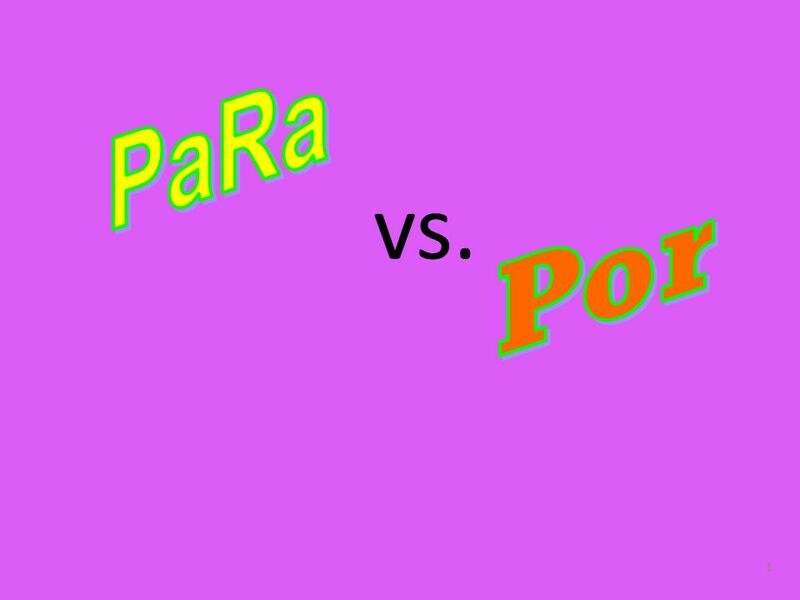 Por vs. Para Por and para both mean For 10 uses of Por 6 uses of Para. 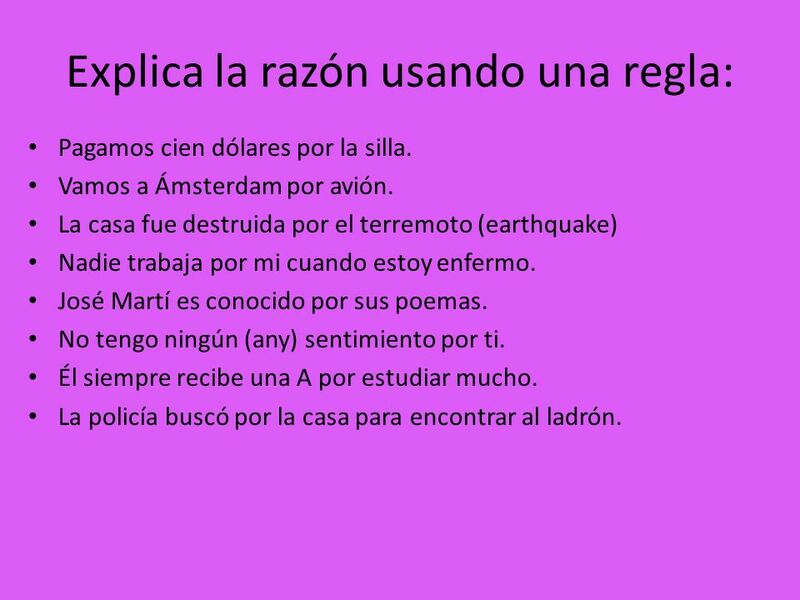 Por y Para Un resumen ¡Qué interesante!. 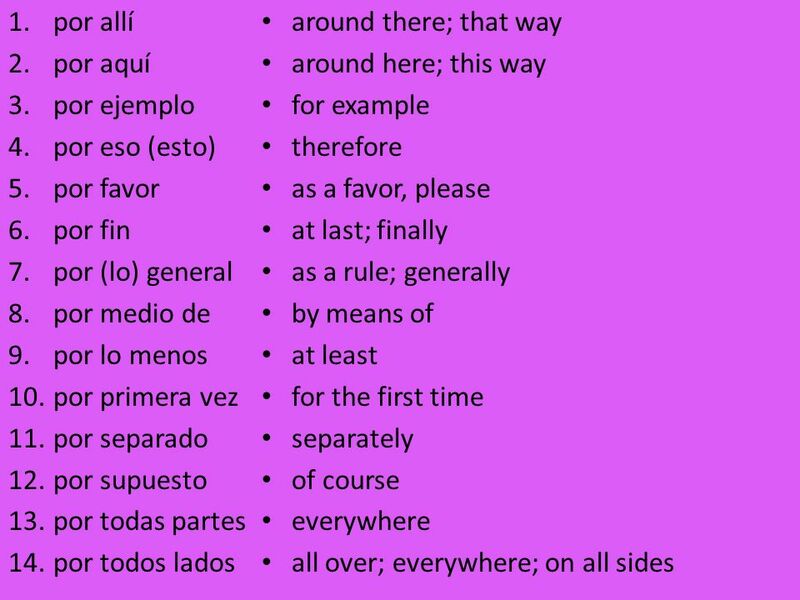 POR A – around a place A – around a place T – through as in by means of T – through as in by means of aRithmetic. Gratitude or apology Thanks for, Im sorry for. Thanks for inviting me. 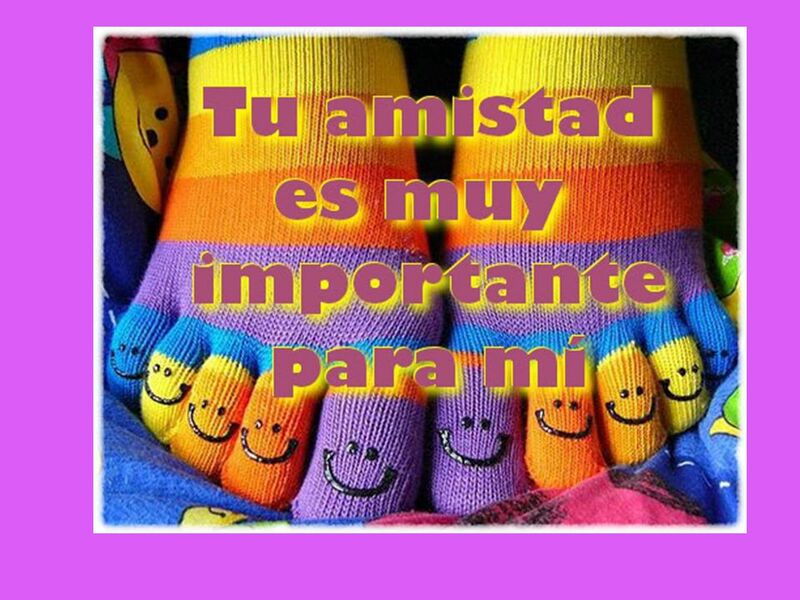 Gracias por invitarme. Im sorry for not calling you. Lo siento por no llamarte. ¿Cómo se llama? 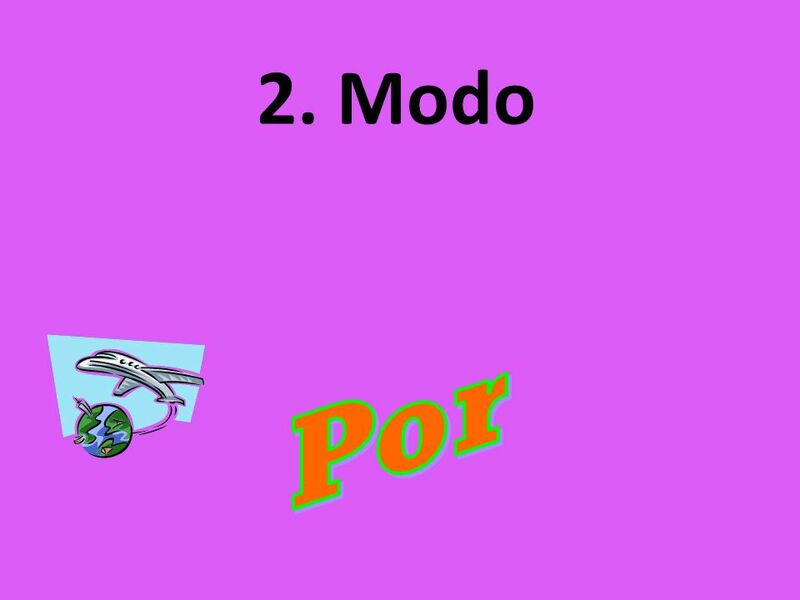 ¿Cómo es (físicamente)? ¿Qué tiene como familia? ¿Tiene animales en casa? ¿Dónde vive? ¿Dónde trabaja? 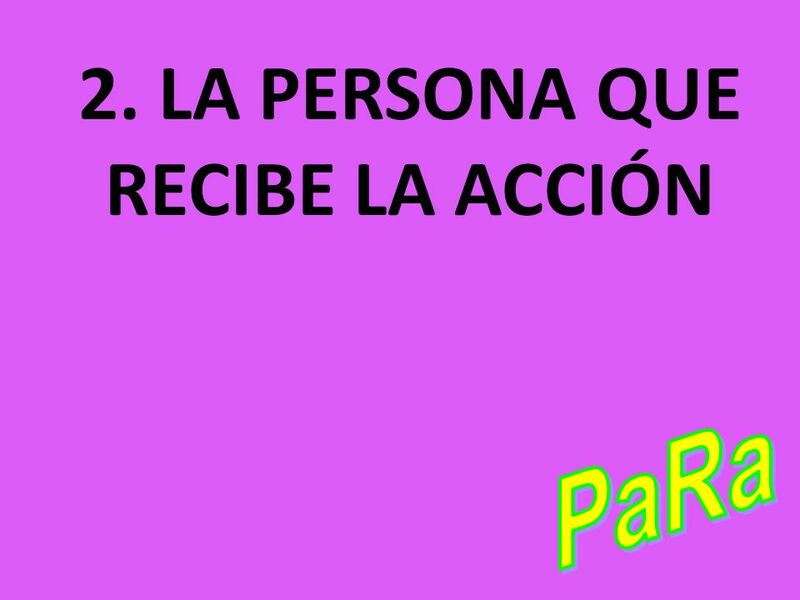 ¿Qué le gusta hacer? ¿Qué no le.